I was feeling a bit homesick on Thursday. Growing up Thanksgiving in our house was almost bigger than Christmas. We would gather with a throng of extended family, always including the Cincinatti fourth cousins. The Macy’s parade in the morning, cooking all day, and playing football. Remember when Zach ran into the palm tree during the fake Florida thanksgiving, and when we ate turkey dinner in Cinderella’s castle? Well this Thanksgiving looked like it was going to be turkey, parade, and football free (they call it gridiron here). To top it off, Nelson was in Hamilton because he did a presentation Wednesday night. Yeah, so Thursday morning was a bit of a sad time. But, at the risk of sounding like a peanuts holiday special, Thanksgiving night was magical. 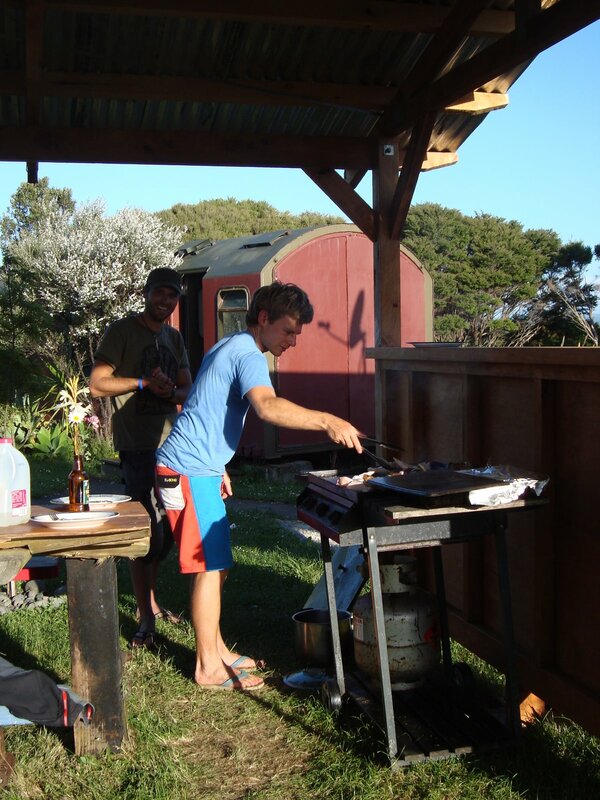 We have been hanging out with a couple from California who are bike-touring through NZ. 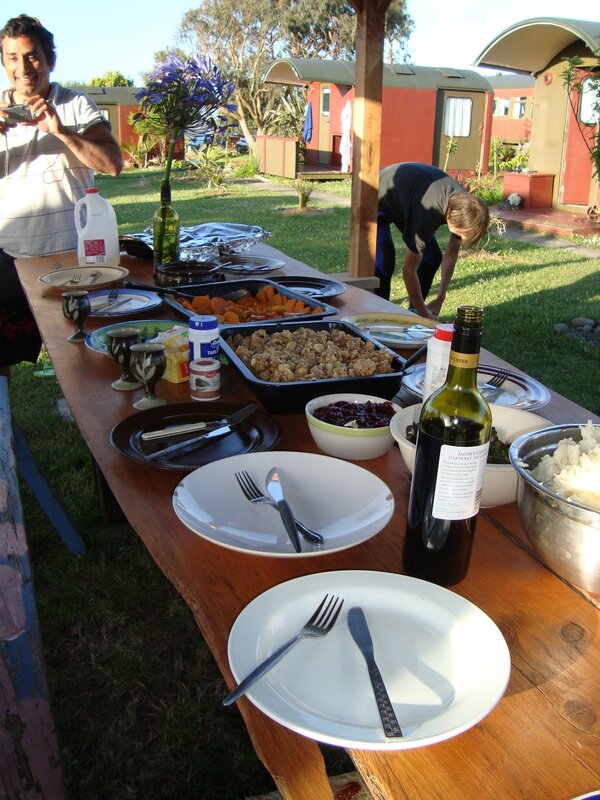 Jen and I decided that we would go all out and show the multinational crew of wwoofers what thanksgiving was all about. It wasn’t hard to convince everyone that a holiday centered on eating was a good idea. By the way, the irony of Eurpoeans celebrating a day of peace with the Native Americans translates well across language barriers. After our 2 hours of wwoof work Jen, Dan, and I headed down to our local grocery store, which is the equivalent of the American chain 7-11. We didn’t have high hopes for putting together an authentic T-day meal. But, thanks to a super helpful French-canadian store clerk we found nearly everything we needed (chicken on the barbey is almost the same as turkey anyway). Yep, that’s right. In New Zealand in the beginning of summer we found yams, stuffing, and get this… cranberry sauce. Just like home, once we started cooking, the kitchen became the most popular place to be. Our list of 8 feasters quickly turned into 15. We were starting to worry about our food supply. But, in true Charlie Brown fashion, (or maybe I’m thinking of the fishes and loaves parable from the Bible), the food was more than enough. The final (and best) magic happened right as we finished eating. While our feasters were in full clean-up mode and we were rocking out to some tune in walks the cutest hitch-hiker I’ve ever seen, just in time for some warm leftovers. Happy Thanksgiving Cincinatti, New Jersey, and even Missouri. we missed you so much. i am sweat-shopping away on your christmas present. i hope I get it done in time! Thanksgiving here was a mixed blessing as well, every cute thing the babies did was punctuated by the fact that you weren’t here to share in it! The table was set for only (gulp) 10, which means we didn’t even need the plywood table or rickety folding chairs. The cousins and other extended family were missed as well but it was you I was missing most!